Problem: These are direct links to your past unhealthy eating and exercise behaviors. They can be events, people, places, things and rituals, such as when you sit on the sofa in front of the TV and it triggers a craving for a snack ­ even if it’s right after you’ve eaten dinner. 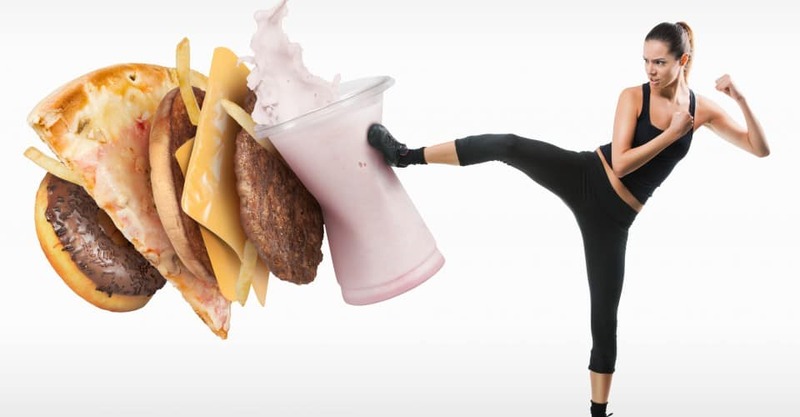 The Fix: Check out your personal food environment. Those who make successful weight-loss resolutions review and change their surroundings by removing the cues that cause them to overeat and not exercise. They use stimulus control ­ for instance, not getting their morning coffee at the bakery or removing “#diet buster” foods and take-out menus for unhealthy restaurants from their homes. That doesn’t mean overhauling your entire life ­ it just means you should remove certain people, places and things, within reason. To change eating and snack behaviors, come up with Calorie Bargains ­ healthy foods that are lower in calories than what you typically eat, but still taste great. And don’t just remove negative stimuli or cues ­ increase positive ones. For example, hang out with people who are supportive of your weight-loss efforts, surround yourself with healthy foods, post reminder notices that you “can lose weight,” buy a pedometer, join a gym and make your environment weight-loss friendly. Problem: There are several types of high-risk situations you need to look out for in order to cope with lapses that can lead to relapses, including negative emotions, food pushers and good news. The Fix: Analyze each of your HRSs and try mapping out a solution before they occur. See the three common HRSs below, along with their fixes. Problem: Negative emotions occur when you’re anxious, depressed, in an argument (with a family member, boss, co-worker, friend, etc.) or simply because you think you deserve it – you’ve had a rough time and should get something to compensate you for your troubles. When stressed, we long for comfort foods such as brownies, doughnuts, candy, ice cream, pizza, mashed potatoes and fried chicken. One reason is that your parents probably gave you an ice cream or a piece of candy when you had a bad day at school or when you lost the big game, so these are what you’re used to having in times of discomfort. The Fix: Come up with healthy comfort foods. Need suggestions? Try eatingwell.com or purchase the book Cooking Light Comfort Food by the Editors of Cooking Light Magazine. Other tips include: Create a “stress snack eating” kit filled with portion-controlled low-calorie snacks to keep in your office or at home so that it’s available when needed. Keep unhealthy snacks out of sight. Develop a stress-eating alternate action plan. Try to find enjoyable, non-food related activities that will distract you: exercising, shopping, going to the movies, using relaxation techniques, working, chatting with friends, reading a humorous book. Problem: There is social pressure to eat in office situations, at family gatherings, on holidays and in other situations. There are a variety of verbal and non-verbal cues that can push and pressure you into making unhealthy choices that could lead to a relapse. Try writing down three typical scenarios when you were around family, friends or co-workers and were made to feel uncomfortable saying no to food. The key is to prepare responses to these types of situations so you’re ready next time. That way, you’ll be armed with an automatic response – one that rolls off your tongue because you’ve thought of it ahead of time and it makes sense! If you are prepared, there’s a better chance that you will be able to control the outcome. Also, understand that rationalizations justify or somehow make OK your decision. Rationalizations do not involve action. They just explain away your actions. Identify what you told yourself about your decisions that allowed you to make them. Last, it’s important to note that there are many “key” and “important” moments in life . Add them up and it could mean 40 overeating occasions per year. Come up with other, healthier ways to celebrate. Problem: These are thoughts that create the desire for immediate gratification. Examples would be craving something sweet or salty, or having the urge to eat a big fattening unhealthy meal. They come in many forms and are often driven by direct links to past behavior or by high-risk situations. The Fix: Surf the Wave – the idea is to ride the craving wave by coming up with other behaviors to focus on in advance so that when the craving comes you can let it ride for 20 to 30 minutes without indulging. Come up with alternatives – like deep breathing, meditating, taking a walk, calling a friend – something you know will make you feel good and pass the time. If you do that, before you know it the craving will pass.